Minnesota Continuing Legal Education is a 501(c)3 non-profit corporation established to provide the highest quality educational experience to Minnesota lawyers and judges in an accessible fashion and at a reasonable cost. Our mission is to provide for and encourage the continuing education of all Minnesota lawyers through the development of a comprehensive variety of services: seminars and seminar materials, books and their supplements, periodical services and indexes. Minnesota CLE works with Minnesota lawyers to help them achieve the other half of successful lawyering – that mix of ethical consciousness, up-to-date knowledge, and practical know-how – which, combined with law school training, helps ensure the competent delivery of legal services to all clients. Minnesota CLE seminars are offered at our state-of-the-art conference center in downtown Minneapolis, Minnesota, other replay locations throughout Minnesota, and online via live web casts. They include half-day, full-day, multi-day sessions, typically divided into segments of various lengths. Seminars are planned and coordinated by our staff programmers and planning committees, who work with the MSBA sections to identify topics, content, and presenters. Sessions are taught by legal professionals who generally volunteer their services. In addition to programs addressing substantive areas and legal procedures, Minnesota CLE offers programs in legal ethics, elimination of bias, law office management, and professional development. Our annual multi-day Institutes offer comprehensive coverage of developments in such areas as real estate, employment, taxation, probate and trust, intellectual property, and family law. 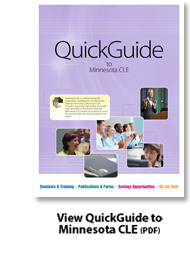 Minnesota CLE publishes outlines and materials to accompany its education courses, as well as other books, pamphlets and materials containing practice guides, legal forms, and reference information. Minnesota CLE publications address the full range of legal subjects, practice areas and matters of interest to lawyers and judges. All publications are intended to educate legal professionals and aid them in the practices and administration of the law. Materials may be available in printed and electronic form; some are distributed through our website. Minnesota CLE has strived to be an innovator in continuing legal education, especially in methods of delivery and use of technology. Minnesota was the first state to mandate continuing education for its lawyers and judges, and Minnesota CLE has long been recognized as a leader in bar-sponsored education programs.